The last place I visited on my mid-term break was Northern Ireland. Leaving Austria on Wednesday and flying out of Munich Airport in Germany on Thursday, it was a crazy week already. Then right on the tail end of leaving my parents in Germany (not to be seen for another seven weeks) the IES program took us to Northern Ireland. Truthfully, I underestimated just how much traveling I would do during break, and how jam-packed this trip would be. But my excitement outweighed my tiredness and I was ready. 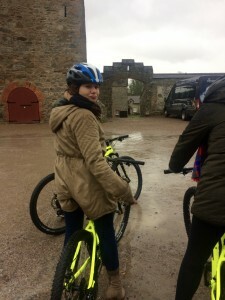 It was so much fun to go on a bike ride where so many filming locations took place! We got to the bus stop on Friday at 7 a.m. From there we headed into Northern Ireland to the place where most of the Game of Thrones TV show is filmed, Winterfell Castle. We did a bike tour and learned archery there. It was so much fun! After that, we went to St. Patrick’s burial site and headed into Belfast to get to our hotel. After a dinner out on the town, it was time for bed. Another early morning was in store for us as we got on our bus to depart for the Carrick-a-rede Rope Bridge at 8 a.m. This was my favorite part of the trip (I’m always a thrill seeker) and the weather was perfect for what was in store. 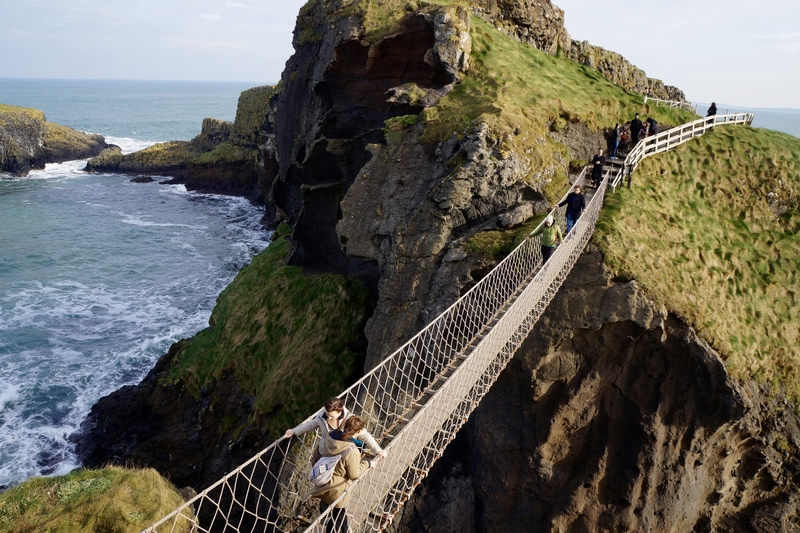 Carrick-a-rede Rope Bridge is a beautiful suspended rope bridge that was originally used by fisherman over 300 years ago! These stones were cool to look at but slippery with the sea spray! After our Giant’s adventure, we headed back to Belfast to eat dinner and head to bed once again. Every year, there is new graffiti on this wall, and every year there are new messages concerning peace and taking down the wall. Sunday was our last day in Belfast City and we didn’t have to be at the bus until 11 a.m. Taking advantage of the late start, some of my friends and myself headed to St. George’s Market to check out some local venders. It was basically like a small-scale Eastern Market (for those of you from Detroit), and it was awesome! Next up was a tour of how the Northern Irish Troubles affected Belfast. For those of you that don’t know about the Northern Irish Troubles, I would highly encourage you to look them up. It is such a recent wound for the country and I know that I didn’t realize how horrific and recent it actually was. 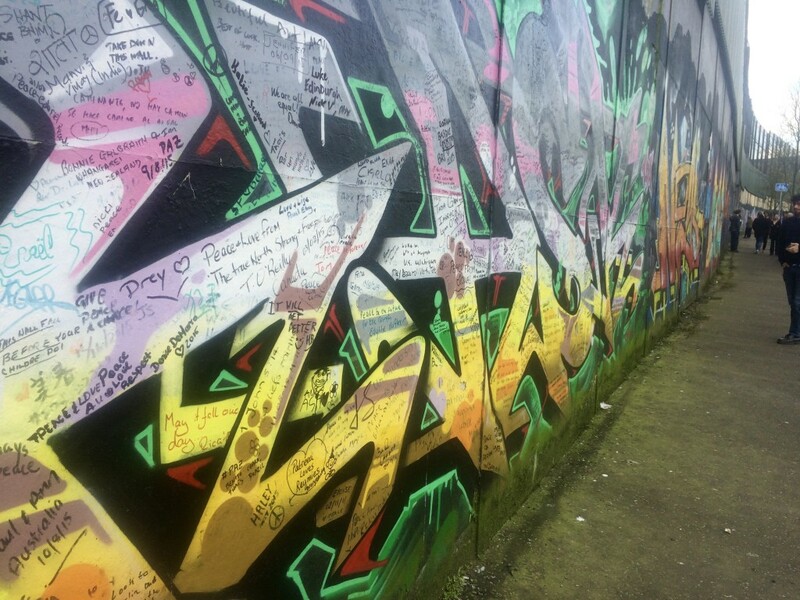 As a part of this tour, we got to see the Peace Wall and the division of the city which is the Catholics and Protestants. The next tour was a tour of the Queen’s Palace, Hillsborough Castle. She stays here quite often with her family, and it was one of the best castles I’ve been to in my time here. Then it was finally time to go home and recuperate from traveling. It was an absolutely fantastic Midterm Break! Thanks for listening to my adventures, until next time!